In October last year I received £450 from LANTRA's Women and Work grant scheme to do some training to improve my skills in forestry. 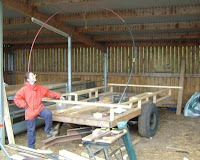 I did courses in Sustainable Woodland Management, Ride Management, Social Forestry and blacksmithing. Last week Lantra celebrated the achievements of women working in male dominated industries in England who had accessed Lantra's Women and Work funding by holding their 2010/11 Awards. From the 5000 women who participated in the Women and Work scheme, winners in the field of Horticulture, Trees & Timber, Landscaping, Game & Wildlife Management, Environmental Conservation and Agriculture were: Jasmine Bellinger, Nicki Jackson, Victoria Forsyth, Lucy Taylor, Hannah Wharton, Elizabeth Cadd, Annabel Foskett. Any women interested in applying for a grant to aid their learning in the above industries during 2011 should contact www.angelakimberley.co.uk/women-and-work/ for more info. 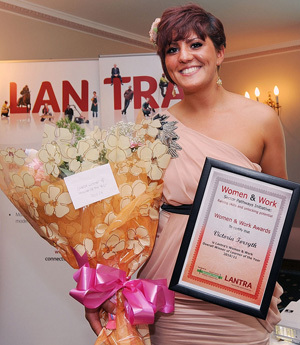 Here is the very glamourous Victoria Forsyth - farm labourer and tractor driver, who not only won the Agriculture Women and Work Learner of the Year Award but was also crowned as Lantra's Outstanding Women and Work Learner of the Year. There she blows! Poop Poop!! Finally we made it down to the wood over the fields before the growing summer crops trapped us to the confines of the farmyard. She is nestled in a newly coppiced and thinned wet wood of mainly alder, hazel, willow, hawthorn, cherry etc. It is still very basic, but you can have a little tour of the inside now. 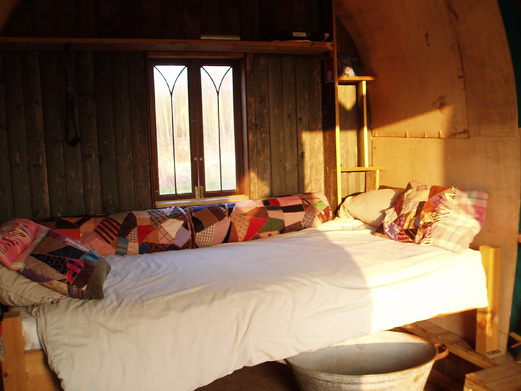 The bunk with my patchwork bolsters makes it a cosy place to sleep at night, whilst the stove manages to boil the kettle in about an hour with some persuasion.Yes, that'll slow down the pace of life a little... we might be looking for a new kettle with a super flat bottom at this rate. There is a distinct lack of storage at the moment, but with some pottering about I'm sure that will develop. Most importantly is where to put the special whisky and chocolate cupboard. Well what else should I eat and drink down here? 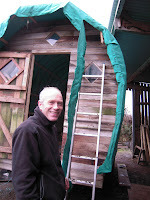 On a more essential note, we dug a compost toilet in the wood between some cherry trees and built a screen around it. The toilet still needs a seat with a hole in it for the 'you know whats' but it will make a visit to the wagon so much more... relaxing? 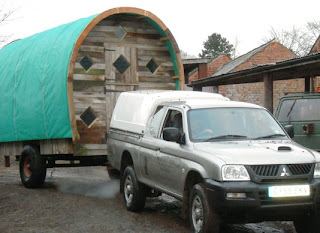 Woodlanders Wagon ...a have a go project! 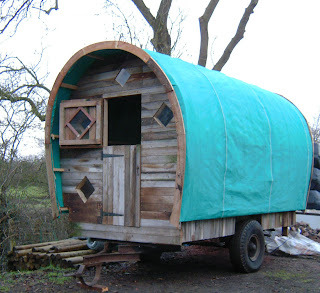 So, let's take a more in-depth look at the wagon in the making. Very much a have a-go-project using scraps of wood and whatever was to hand. Heath Robinson eat your heart out! 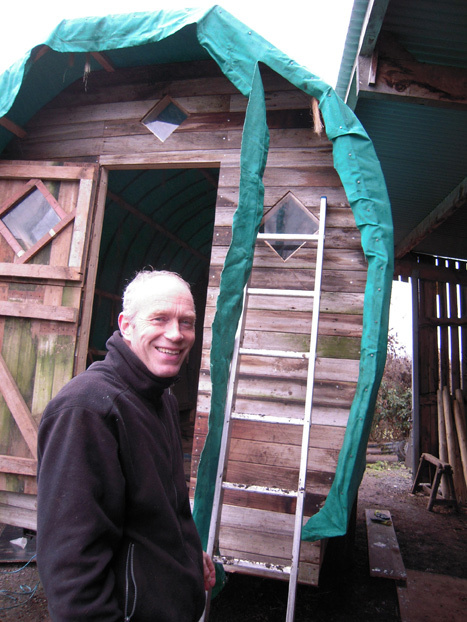 Martin had a derelict old hay trailer which he took to renovating and insulating the floor. 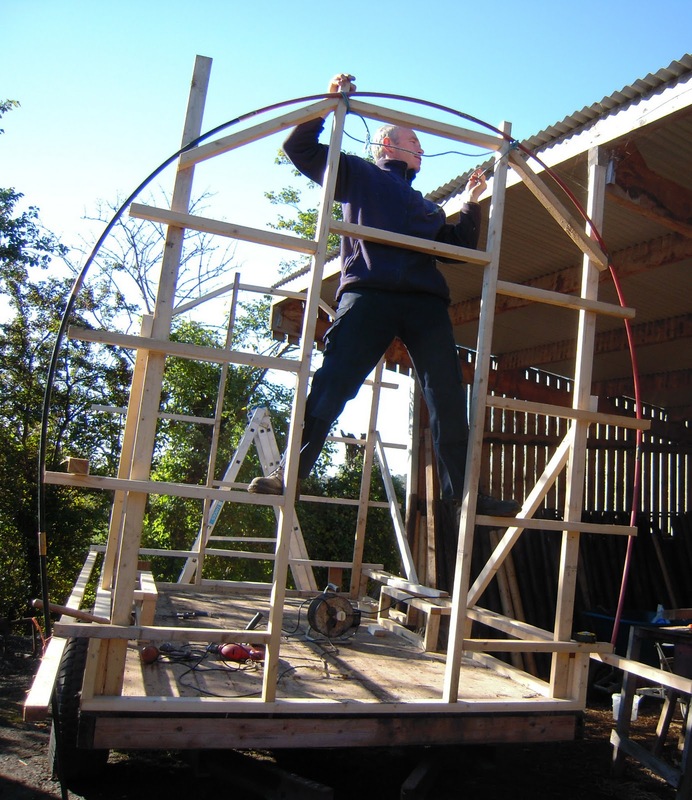 In October 2010 we started working out the shape of the hoop curves...with some handy drain rods propped up to give us the general idea of overall height so we could build the front and back walls first by attaching uprights to the trailer bed. Later Martin does his Universal Man impression climbing up on the front frame to insert the noggins. Most had to be cut at different angles to get the outside curve shape. All I could think about every time the word ' noggins' was mentioned was 'Noggin The Nog'. A little confusing for me being a general carpentry novice. Next job was attaching the long rails for the sides to the front and back panels. 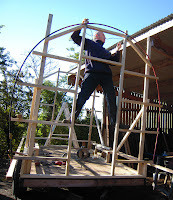 Alder hoops were then square lashed up and over both sides of the trailer and crossed in the middle. 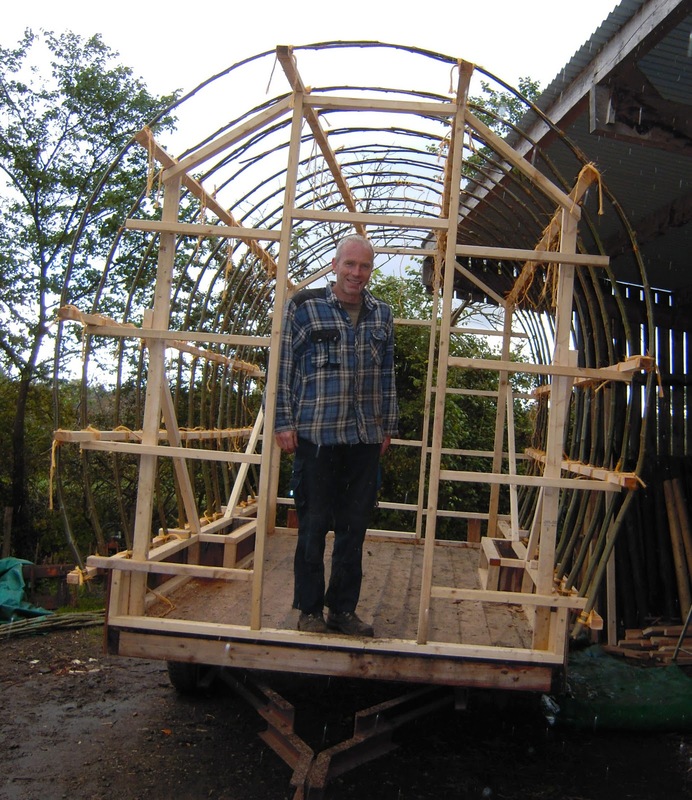 This is what the canvas would sit on, so sharp edges from any coppiced hoops had to be removed. Here is a better picture from the side of the square lashing. 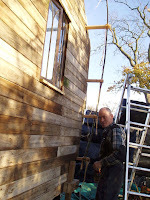 Martin made a door in two halves, and we started boarding the front and back walls with cedar tongue and groove that came from an old chicken shed on the farm. 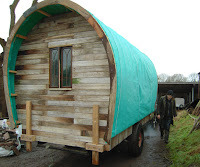 The barrel shape edge was cut with a jigsaw cutter, so we could finally get the canvas over the front and back ends to protect the inside from the rain. gothic shaped window in place. We thought it would be nice to add some windows, so cut out some cardboard shapes and pinned them to the front boarding, adjusting and rearranging them until we were happy. Diamonds seemed to be a nice shape, and broke the front of the wagon up enough giving an adequate amount of light into the interior. The canvas went on temporarily to keep out the rain and snow, but then there seemed to be an eternal wait during the December when the freezing snowy weather put work on hold. 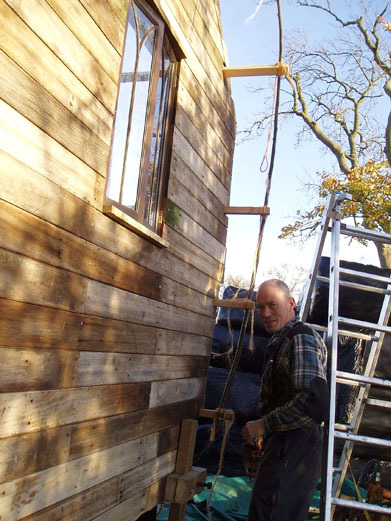 Inside the front and back walls were panelled in a very rustic dark green timber reclaimed from a tree house. The canvas was finally fixed with batons along the sides with tacks and a lot of pulling to try and make the canvas taught. The extra canvas was trimmed off and then the wooden edging was cut to follow the front and back curves..probably the most fiddly bit of all. They didn't seem to sit very well when screwed over the canvas, but that's something to consider for next time. Martin trims off the excess canvas. 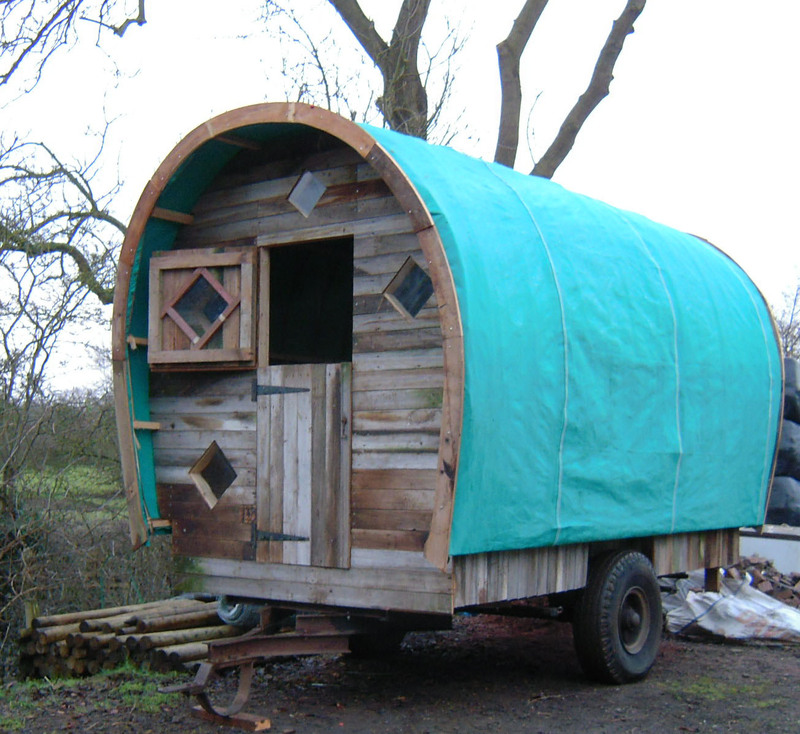 Back view of the wagon with stays up. 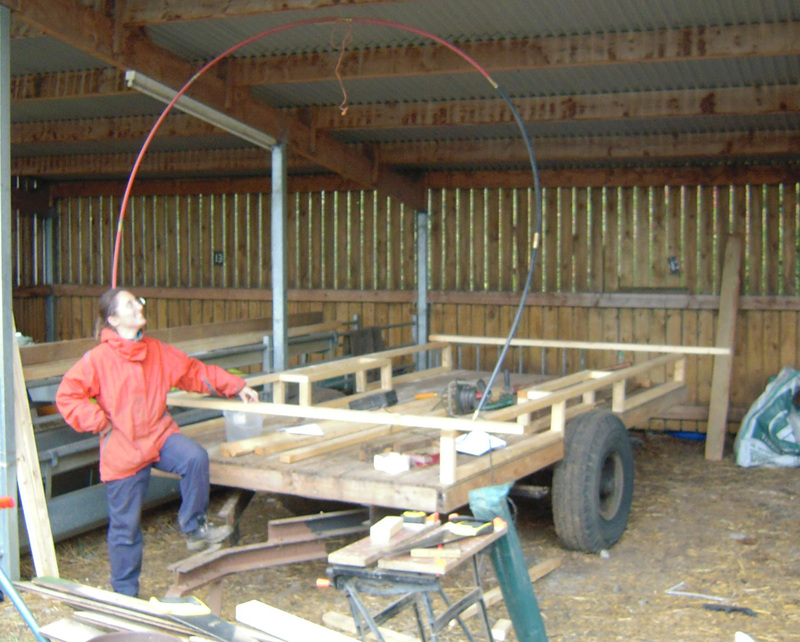 At the back we added some stabilizers as the hay wagon only had 2 wheels and tips up if you walk to the back of the wagon! This makes it pretty easy to maneuver however and finally we gave it a turn round the farm yard. With the lack of locks or catches on the doors though, all the windows and doors flew open as Martin drove off. The crashing sound of the newly purchased stove pipe rolling across the floor was also a little worrying. As the wagon came to rest and the potential damage was surveyed, only a dint in the flue pipe could be found. Here she stayed for a couple of months while the stove pipe was fitted, a bed made across the back wall, some shelves put up and latches and seat cushions added. 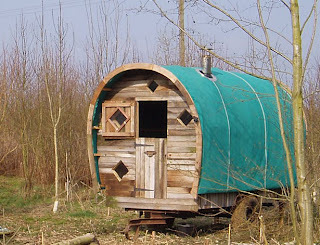 The stove came from The Windy Smithy and is an ideal lightweight stove for wagons. Although it takes quite a while to boil a kettle, it ticks over nicely reaching a comfortable 17 degrees C inside. The other morning (late March 2011) we finally got the go ahead and took the wagon across the fields to the wood where it will stay over summer (we hope). I love the way the wood coloured board fit into the woodland setting just right. If I could tone down the green canvas a bit it would blend in a little more! 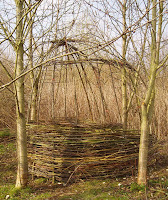 She is nestled in a newly coppiced and thinned wet wood of mainly alder, hazel, willow, hawthorn, cherry etc. There is a distinct lack of storage at the moment, but with some pottering about I'm sure that will develop. Most importantly is where to put the special whiskey and chocolate cupboard. Well what else should I eat and drink down here? Liz (aka Greenwood Woman) sitting on the front porch. 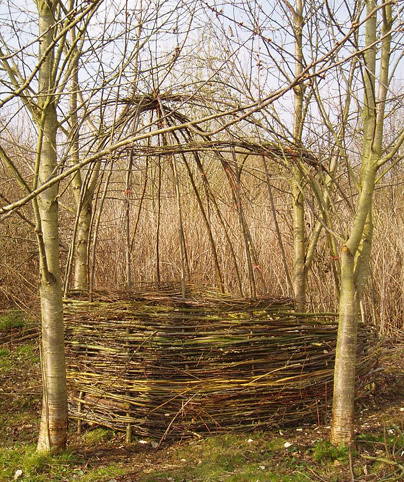 On a more essential note, we dug a compost toilet in the wood between some cherry trees and built a willow screen around it. Now I'm happy to stay down here for days!